You are resurrected by Zeus as you an undead ancient Greece zombie hero, Altered Beast is probably among the best. Side scrolling through graveyards and the underworld was made all the better by being able to transform into a werewolf, weredragon (who can shoot lightning bolts out of his eyes), weretiger, and a werebear, which is just as badass as it is hilarious to say aloud. Plus, the majority of the game is spent kicking zombies in the groin until they explode. The game feels a little rusty these days, but it still holds up as one of the finest platformers around. "Rise from your grave!" These are the first words you hear the moment you start the game. In this game, you are a warrior resurrected by Zeus to save his daughter from the clutches of the Lord of Darkness. To aid you in your battle against the god like necromancer, you have the power to transform into various powerful animals. If you manage to succeed, your reward is... to play the whole game again on a harder difficulty! Download this classic arcade game today! Now you can add videos, screenshots, or other images (cover scans, disc scans, etc.) 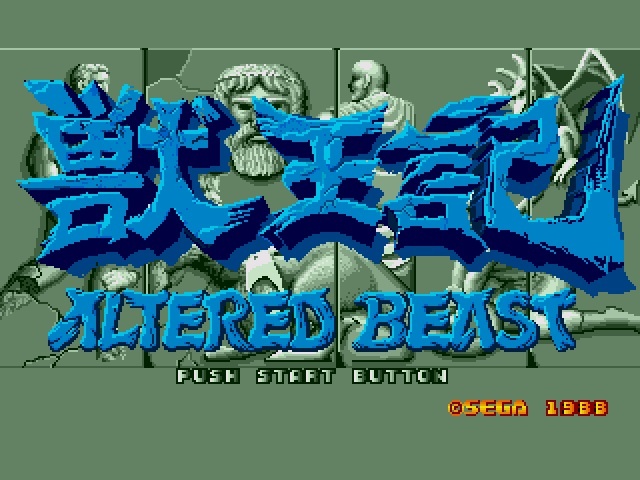 for Altered Beast (USA, Europe) to Emuparadise. Do it now!